President Trump speaks to supporters during a campaign rally on April 28, 2018, in Washington Township, Mich.
Senate candidates Luke Messer, Todd Rokita and Mike Braun, from left, participate in a Indiana Republican Senate Primary Debate, Monday, April 30, 2018, in Indianapolis. "They agree that when it comes to immigration that a wall should be built along the border with Mexico. They also agree that the Russia investigation is quote a 'witch hunt' and must end now," said moderator Abdul Hakim-Shabazz. "And they're also strong supporters of the Second Amendment right to bear arms, and they support arming teachers in the classroom. So we will not spend any time on those issues in the questioning." The number one question from Hoosiers was about the candidates' support for President Trump, and they wanted specifics on where they disagreed with him. Much like job candidates asked by a prospective employer what their weaknesses are, they couldn't identify any. Rep. Todd Rokita touted his support for Trump during the 2016 campaign. "The president knows that I had his back when he needed it most: against crooked Hillary Clinton," he said. Rival Rep. Luke Messer praised Trump's North Korea strategy. "President Trump deserves a Nobel Peace Prize," he said. While businessman Mike Braun highlighted his parallel to Trump as the political outsider in the race. "I'm on record saying President Trump was the inspiration for why I ran and he needs more reinforcements like me," he said. 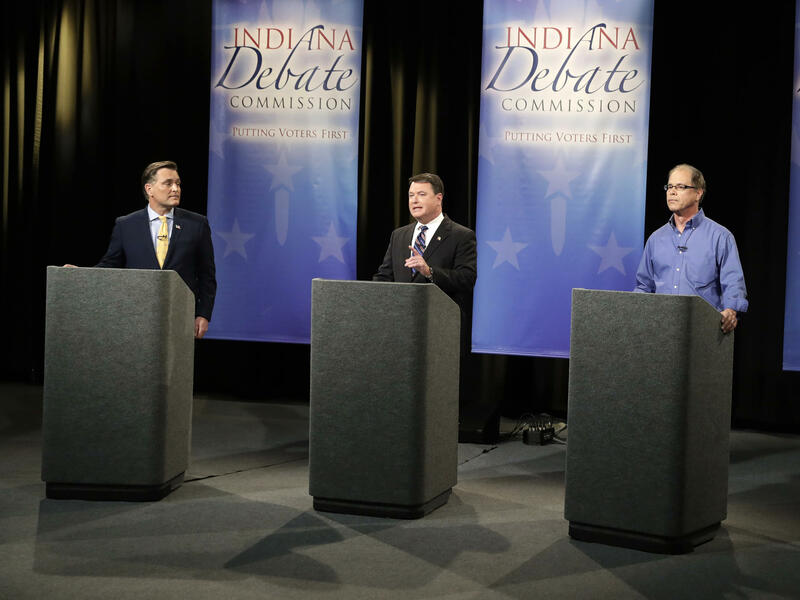 Rokita, Messer and Braun are locked in a tight battle for the GOP nomination to face off against incumbent Democratic Rep. Joe Donnelly in November. Echoes of this primary dynamic are playing out in GOP primaries in congressional and gubernatorial races all over the country right now, where Republican candidates are in lockstep with Trump's agenda and waging campaigns over the more nuanced question of which candidate voters believe will be the most loyal fighter for President Trump. Despite low national approval ratings, a steady stream of administration controversies and the ongoing investigation into Russian interference in the 2016 election led by Justice Department special counsel Robert Mueller, nothing has shaken President Trump's enduring popularity among Republicans, where his approval ratings hover around 90 percent. Veteran House and Senate campaign strategist Andrea Bozek says in 2018 Republicans are less concerned with the old, familiar metrics that used to drive primary campaigns, like conservative vote ratings, or whether candidates had signed an anti-tax pledge. "I think now it's how much support have you given the president in the past, and what can you do to support his agenda going forward?" she said. The conservative groups that used to drive those wedges in primary campaign debates, like the anti-tax Club for Growth, agree that the politics of Trump's personality are a more decisive factor in this political environment. 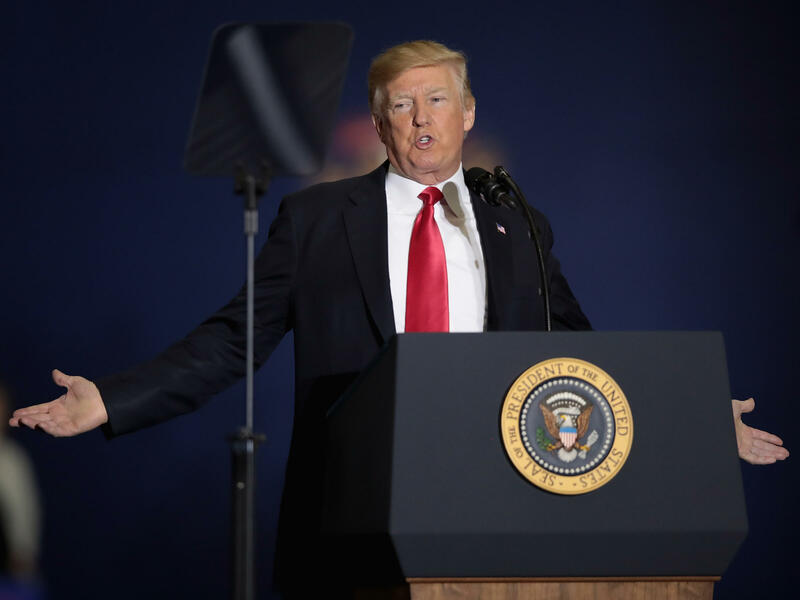 The group's president, David McIntosh, says Republicans primary voters see a president under siege, by Democrats and the media, and they are motivated above all else to vote for the candidate who will fight on his behalf. "Republican primary voters think we need to send people to Washington who will back him up because he's under attack, and so I think the urgency of that phenomena has created the personality test to be larger than the ideology or the issue test," he said. Club for Growth is engaged in more than a dozen House and Senate primaries, and even where the attack ads involve policy issues like health care, the message is centered on where the candidate is in relation to the president. For instance, in an open Ohio House race, the Club's latest attack ad hits their opponent as someone who is "Not on Trump's side--or yours." Ohio also holds primary elections on Tuesday, May 8. In the gubernatorial race, Republicans Mike DeWine and Lt. Gov. Mary Taylor are engaged in another contentious primary in which their campaign attack ads highlight the others' lack of support for Trump. "She claims she's conservative but Taylor refused to endorse Donald Trump for president over Hillary Clinton," states one DeWine line of attack. Democrats also face an open gubernatorial primary, with former Ohio Attorney General and Consumer Financial Protection Bureau head Richard Cordray and former Rep. Dennis Kucinich competing for the nomination. In West Virginia's three-way Republican Senate primary, also taking place Tuesday, Rep. Evan Jenkins is hoping the fact that he was the first to endorse Trump back in the 2016 campaign will help him edge out rivals. He's up against state Attorney General Patrick Morrisey and former coal executive Don Blankenship, who served a year in prison after being convicted in 2015 on a misdemeanor count of conspiring to violate federal mine-safety laws. Jenkins pointed to his support for Trump during a Fox News debate this week. "Who did you vote for in the May primary in West Virginia, I endorsed and voted for Donald Trump. Who did you vote for?" Jenkins said to Morrisey during this week's Fox News debate. "I support the president," Morrisey responded. The winner of Tuesday's primary will take on incumbent Democratic Sen. Joe Manchin in November. This entire GOP strategy of aligning tightly with Trump on his agenda and mirroring his rhetoric is bucking the conventional wisdom of midterm elections, where the president's party historically loses seats in Congress and candidates traditionally look to keep their distance from the White House. GOP pollster John McLaughlin, who worked on Trump's 2016 campaign, says if Republican candidates want to get the Trump voter to turn out this year, it makes sense to run as close to Trump as possible. "The Democrats organically are getting out their anti-Trump vote, and the Republicans need to get out that pro-Trump voter who didn't vote in 2014, but came out in 2016 because of Donald Trump." That strategy is not without risks. Republicans running as mini-Trumps in primaries could be making themselves more vulnerable in the November general election where a more competitive and diverse electorate will decide the winner. Operatives like McIntosh say Republicans have made a different calculation about 2018. "I think the old formula is that you want the purple-y candidate or the squishy candidate so he can appeal to both sides in the general election is a recipe for failure for Republicans this year," he said. Copyright 2019 NPR. To see more, visit https://www.npr.org.